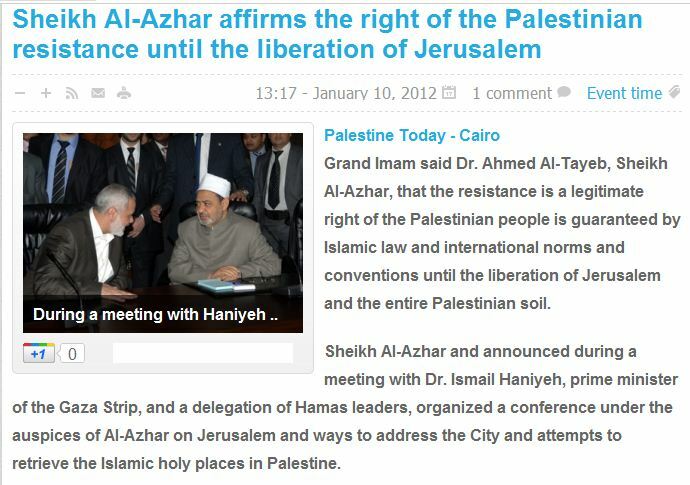 AL-AZHAR GRAND IMAM AFFIRMS ARABS’ ‘RIGHT TO MURDER JEWS’ UNTIL ISRAEL IS DESTROYED……. – The Tundra Tabloids……. AL-AZHAR GRAND IMAM AFFIRMS ARABS’ ‘RIGHT TO MURDER JEWS’ UNTIL ISRAEL IS DESTROYED……. NOTE: The analysts that refuse to call these key players in Egyptian politics by the right name, fundamentalist Muslim genocidal-homicidal maniacs, should be run out of the profession. He appealed to Sheikh Al-Azhar all the Palestinian factions continue to unite efforts and the rejection of division and conflict, stressing that the unit is for the Mujahideen to achieve their goals, and that the band shall be deducted from the balance of the Palestinian factions in the face of Israeli aggression. Also called the Grand Imam of educational curricula to include all Arab countries and Islamic history of Jerusalem and the definition of new generations of the Islamic right in Palestine and the Israeli media revealed allegations that disinterested distorted truths of religion and history. For his part, praised Ismail Haniyeh, the position of Al-Azhar towards the Palestinian cause, and the role of the Egyptian intelligence service in the success of the prisoner exchange deal. He also Haniyeh of Hamas on behalf of the Egyptian people for the success of his revolution, which was supportive of the Palestinian issue at various levels, Haniyeh said that the file is the resistance of the constants of the Palestinian people and that no waiver of this option until the liberation of Palestinian soil. Previous Post Previous Post PALESTINIANS USING ‘CAR PROTESTS’ IN JUDEA AND SAMARIA TO SPREAD FALSE MEME……. Next Post Next Post MEXICAN MUSTARD SHOOTS UP POLICE IN ALABAMA CITY, ALABAMA, SAID HE DID IT FOR ISLAM……. When they say “International Law” they mean sharia. That’s why the Muselmanic nations never signed the International Declaration of Human Rights and replaced it with the perverted ‘Cairo Declarations of Human Rights’, an absurd construct that subjects all rights to sharia, Islamic law. Too bad that western elites have steadfastly refused to study these texts. One wonders if they ever read anything at all apart from their inflated salary slips and their holiday bookings.